UND ZWEI HEILIGEN Linker Flügel: CHRISTI GEBURT Rechter Flügel: KREUZIGUNG Tempera auf Holz mit Goldgrund. Dieser wunderbar gemalte Flügelaltar weist einige der typischen Merkmale der florentinischen Malerei um die Mitte des 14. Jahrhunderts auf. Man erkennt hier, zwar weiterentwickelt und neu überdacht, noch deutlich die Einflüsse Giottos, die jedoch vor allem von Bernardo Daddi in ein neues Licht gerückt wurden. 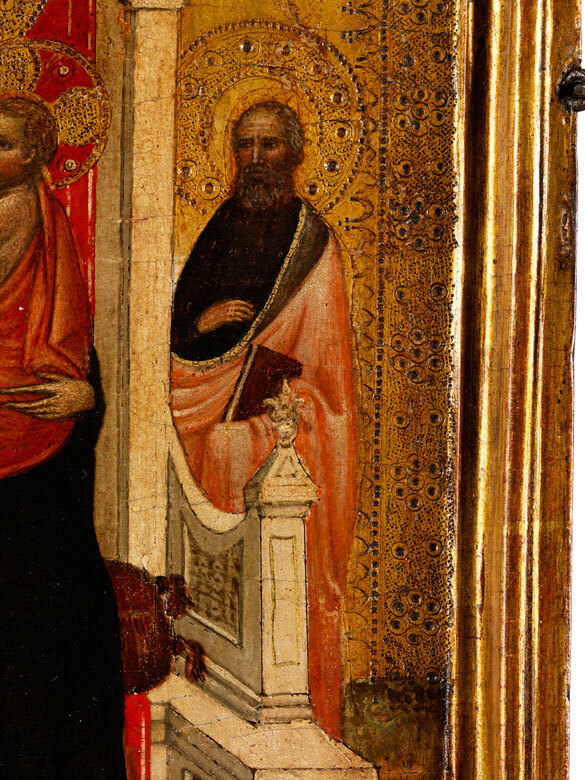 Später folgten dann Jacopo del Casentino, Maso di Banco, Simone Martini und dann die Folgegeneration Giottino und Giovanni da Milano seinem Beispiel. Alle diese Meister orientierten sich an Giotto, ließen jedoch dessen plastisch-räumliche Gestaltung hinter sich. So gewann ihre Malerei, neben spätgotischen Anklängen wie sie auch unser Altar aufweist, an Farbe, Weichheit und Anmut. Die drei Altarflügel gehören demnach in diese Umbruchsphase der florentinischen Malerei, die sich 1348, nach der verheerenden Pestepidemie in Europa, selbst erneuerte. So entwickelte sich, trotz Kontinuität mit den von Giotto zu Beginn des Jahrhunderts gesetzten Maßstäben, eine historisch-künstlerische Blütezeit, die erst heute in ihrer ganzen Vielfalt erkennbar wird. Das Mittelbild dieses erlesenen Hausaltars stellt nach byzantinischem Modell die Gottesmutter thronend als Regina Coeli, als Symbol der Kirche, dar. Die beiden Heiligen, die sie flankieren - sie sind hier ohne Attribute dargestellt, daher lässt sich nur vermuten, dass es sich um Josef und Anna handelt - unterstreichen den majestätischen Aspekt, ganz im Einklang mit Giotto und der Schule von Siena. 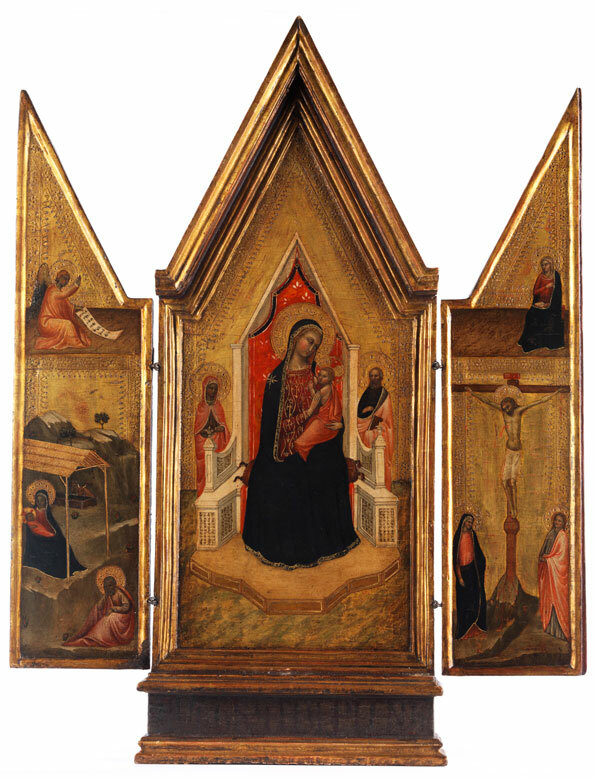 Die Darstellungsweise ist etwas vereinfacht, wird jedoch durch das Jesuskind belebt, das sich gerade an der mütterlichen Brust nährt, nach dem Modell der Maria lactans. Die beiden Seitenflügel folgen hingegen ganz der ikonografischen Tradition: in der oberen Bildhälfte beider Flügel ist die Verkündigung dargestellt, die Geburt rechts, die Kreuzigung mit der Jungfrau und dem Evangelisten Johannes auf der linken Seite. 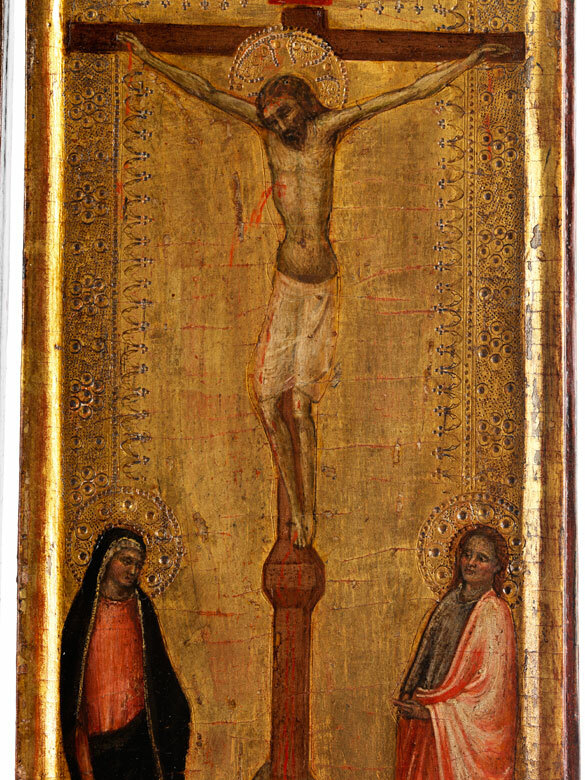 Tempera on panel with gilt ground. 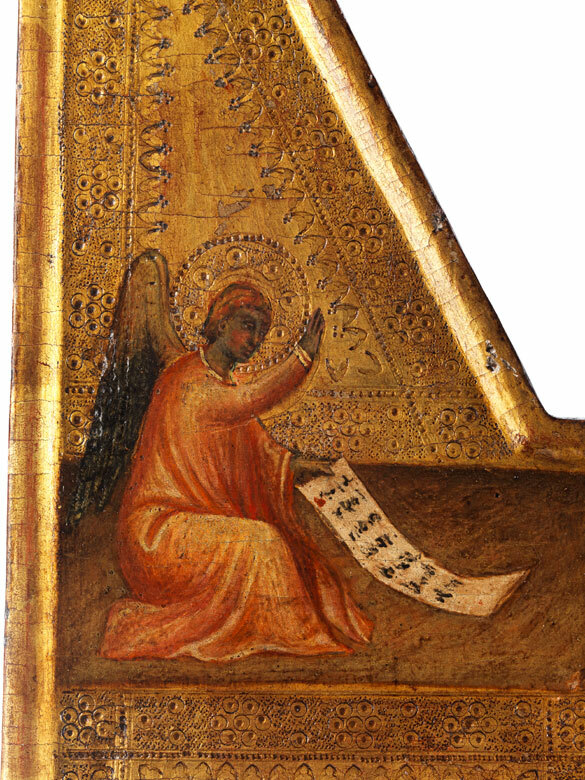 This wonderfully painted winged altar is typical of the Florentine School of the mid-14th century. 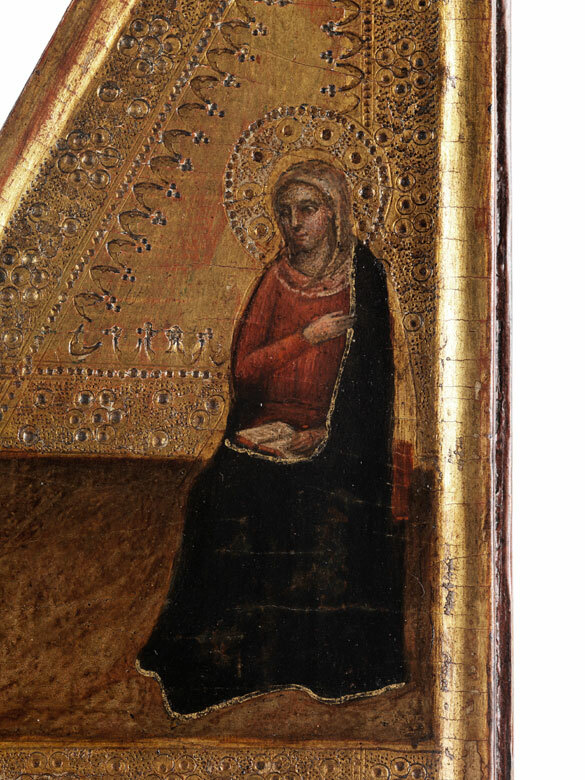 Giotto’s influence is still clear, but also that of later artists including above all Bernardo Daddi, who introduced a new approach, as well as Jacopo da Casentino, Maso di Banco, Simone Martini and the succeeding generations with artists such as Giottino and Giovanni da Milano. 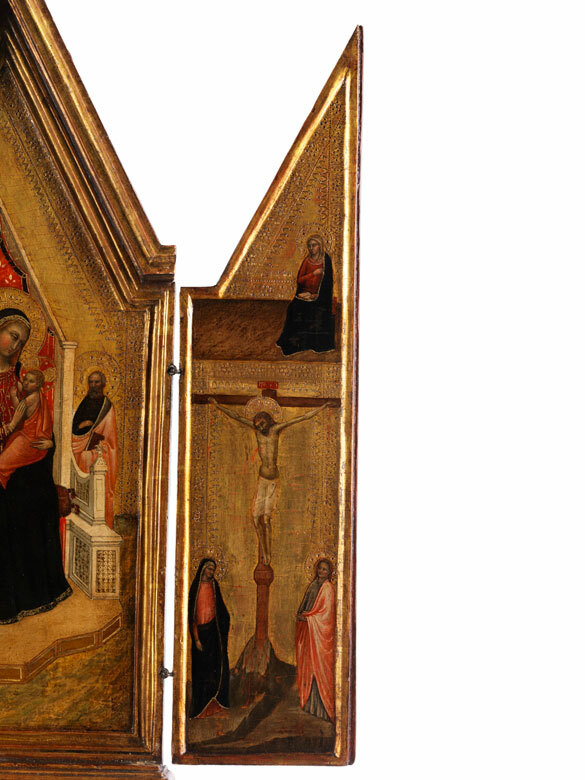 Giotto is the landmark for all these masters, but they left behind his sculptural three-dimensional style. As can be seen in our altar, their painting style gained instead in colour, softness and grace, besides retaining Late Gothic reminiscences. 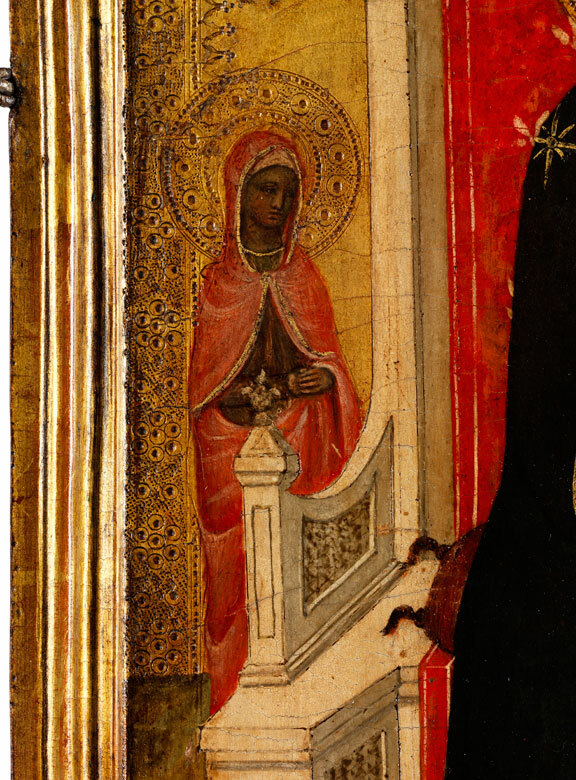 Thus, the three altar wings fit within a period of upheaval in Florentine Painting after 1348, when Europe renewed itself after the devastating pest epidemic and continuing with the artistic standards set by Giotto at the beginning of the century, it flourished in a historical and artistic golden age, whose diversity can only be perceived today. 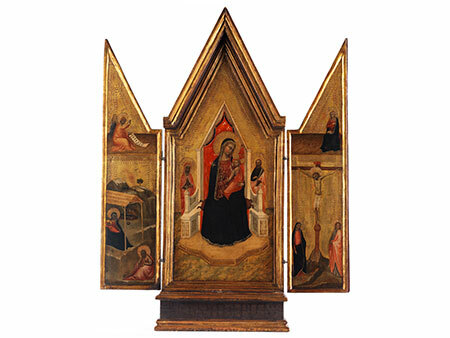 The central image of this exquisite home altar depicts the Virgin Mother and Child after Byzantine models enthroned as Queen of Heaven as the symbol of the Church. It can be assumed that the saints either side, depicted without any attributes, are Joseph and Anna. 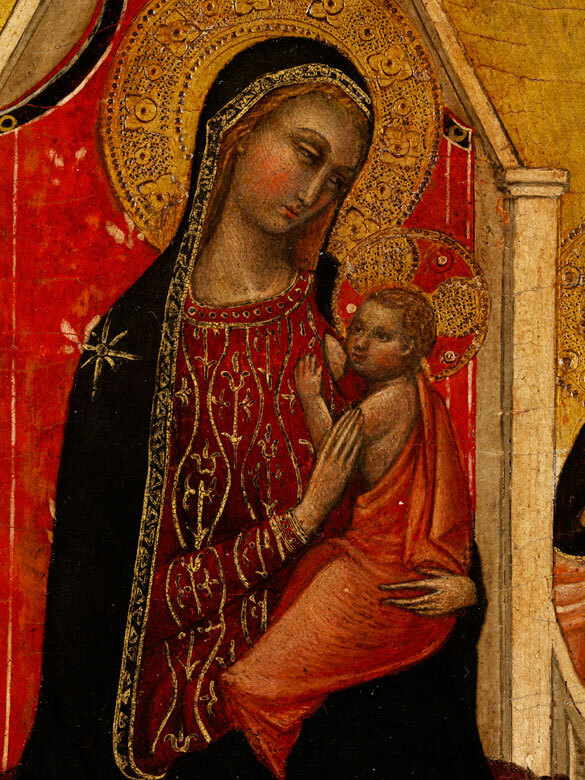 They underline the regal aspect in keeping with the tradition of Giotto and the School of Siena. 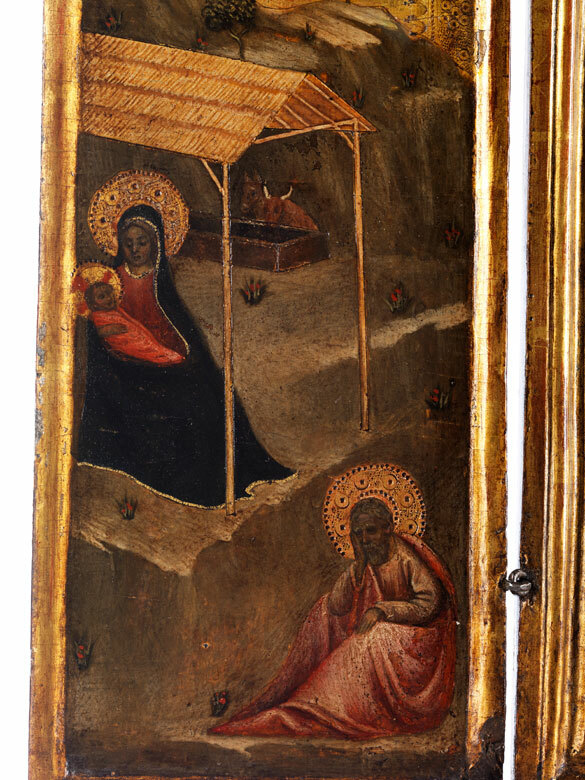 The slightly simplistic manner of representation is livened by the Christ Child, being breastfed by his mother in the iconographic tradition of the Maria Lactans. 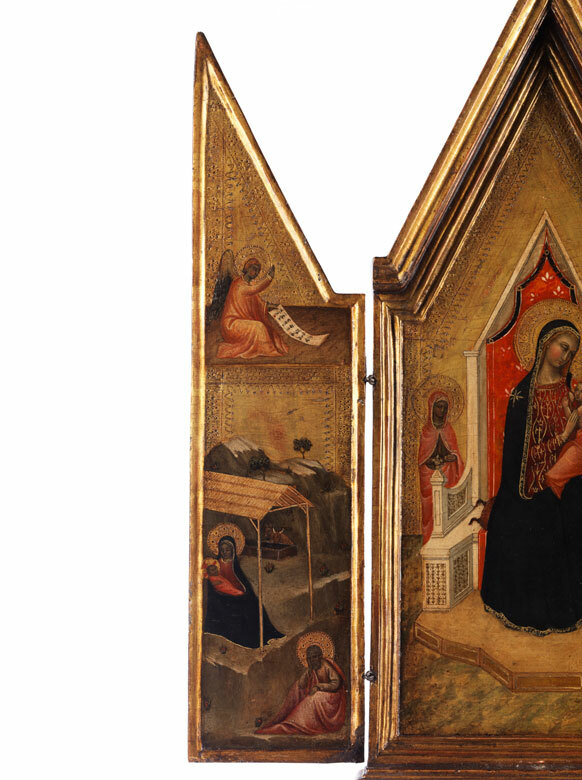 By contrast, both side wings entirely follow the iconographic tradition: the upper section of both paintings depicts the Annunciation with The Nativity on the right and the Crucifixion with the Virgin and Saint John the Evangelist on the left. 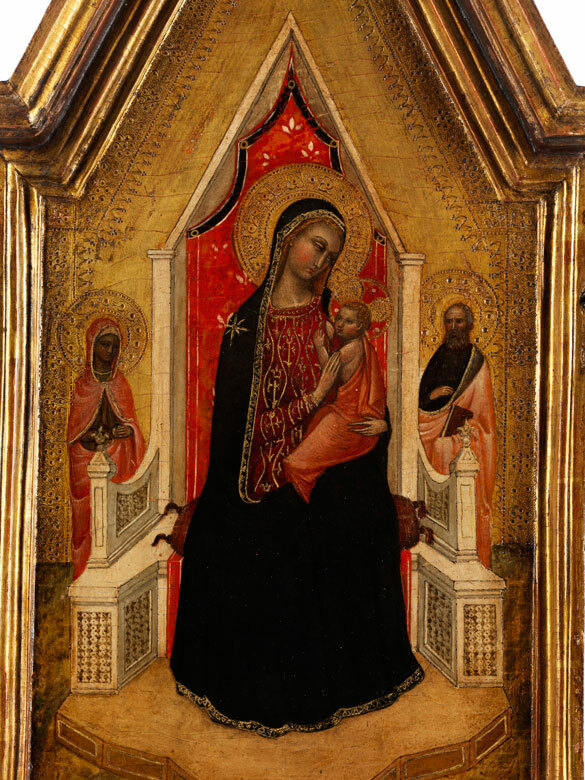 Apart from the general influences of Giotto and his workshops, the painting specifically calls to mind works like: the “Madonna di Ognissanti” (Uffizi, Florence), the “Polittico Stefaneschi” (Rome, Vatican Museums) and the “Polittico Baroncelli” (Florence, Santa Croce), and especially works by Bernardo Daddi (compare “Madonna in trono con il Bambino tra quattro santi”, Galleria Nazionale, Parma, and “Madonna in trono con angeli e santi” Uffizi, Florence, and a winged altar, formerly Bondy Collection, Vienna); it shows stylistic elements by Maso di Banco’s “Alterolo Babbott” (Brooklyn Museum, New York), which are here translated into a priestly, elegant style, however no attribution to any particular artist or workshop can be made.